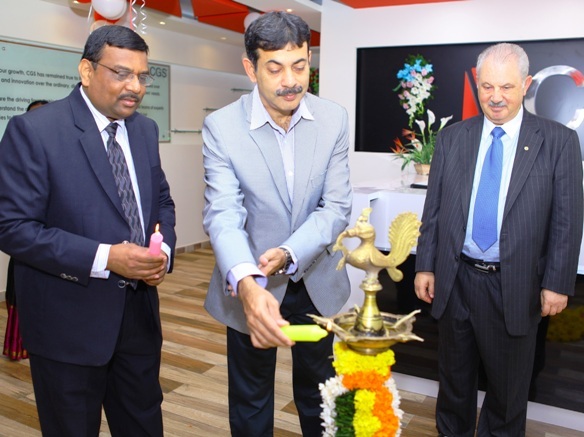 Hyderabad, August 2016 – CGS, a global provider of business applications, enterprise learning and outsourcing services, today announced the expansion of its activities in India by opening its new office in Hyderabad. This expansion will support CGS’s growing list of global clients. Known as one of the premier technology destinations in India, Hyderabadoffers CGS a direct link to thecountry’sIT ecosystem. The new world-class office, which nearly doubles the company’s capacity in the region, supports CGS’s worldwide growth by adding new product lines for software development and support.“We are delighted that CGS India has shown remarkable growth over the last many years, and is moving into its new facility. Hyderabad's prowess in Information Technology is now renowned the world over, and we see more and more marquee names choosing this city over others to set up their units here,” said JayeshRanjan,Secretary to the Government of Telangana for InformationTechnology,Electronics and Communications. “CGS too is a marquee company serving the fashion/apparel vertical, and its significant presence in Hyderabad is a matter of pride for us. The Government of Telangana reiterates its commitment to fully support the growth of CGS India and have a long-lasting partnership with it.”“We have been operating in Hyderabad since more than a decade and with our continued employee growth, this new facility offers us more than added space – it brings us inclose proximity tothe heart of the high-tech city area,” said Jithendra “Jithu” Rao Battu, country manager, CGS India. For over 30 years, CGS has enabled global enterprises, regional companies and government agencies to drive breakthrough performance through business applications, enterprise learning and outsourcing services. CGS is wholly focused on creating comprehensive solutions that meet clients’ complex, multi-dimensional needs and support clients’ most fundamental business activities. Headquartered in New York City, CGS has offices across North America, South America, Europe, theMiddle East and Asia. For more information, please visit www.cgsinc.com and follow us on Twitter at @CGSinc and @BlueCherryCGS and on Facebook.